This recipe from Isa Does It is the first I’ve posted from the Sunday Night Suppers section. You know, recipes that you could pull together on a weeknight, but really, why not spend a leisurely Sunday with your friends or your kids or your mom or some stranger off the street, hanging in the kitchen and cooking dinner together? PS I just wanna’ give a shout out to my girl Kate Lewis for the amazing styling on this one! It was tough to make a dug-into casserole look so ridiculously appetizing, but Kate found a way. Thanks, girl! ~If you want to add extra heat, there are a few ways I can recommend doing it. Saute a sliced, seeded jalapeno with the onion for the filling, or try an extra jalapeno in the sauce. ~The white sauce is not entirely necessary, but it’s easy enough to do and it looks (and tastes) great. If, however, it’s too much to finagle at the moment or you forgot to soak cashews, then you can just serve topped with some guac. If you wanted to serve with your favorite meltable vegan cheese instead, then I can try to look the other way. ~I love the tenderness of pintos here, but feel free to use black beans! I bet lentils would be yummy, too. But that’s no surprise because I always think lentils would be yummy. ~This is definitely more of a Sunday night supper, but if you want to enjoy it on a weeknight, it can happen. Make the enchilada sauce the night before and be sure to soak your cashews. Everything will come together in a snap! Line a large rimmed baking sheet with parchment paper. Toss the potatoes with the oil right on the baking sheet. Sprinkle with fresh black pepper and salt, and toss to coat. Bake for 15 minutes, reduce the heat to 350 F, flip potatoes and bake for 10 more minutes. Leave oven at 350 F because that is the temp that the enchiladas need to bake at. Preheat a 4 quart pot over medium heat. Dry toast the cumin and coriander seeds in the pan for about 2 minutes, stirring frequently, until they’re fragrant and a few shades darker, just be careful not to burn. Add the oil and saute the onion, jalapeno and garlic with oregano and a pinch of salt for about 5 minutes, until onions are translucent. Add the tomatoes, salt and agave, cover pot turn the heat up to bring to a slow boil. Let cook for about 20 minutes. Once cooked, puree until smooth with with either a submersion blender or by transferring to a blender of food processor. If using a blender, intermittently lift the lid to let steam escape so that it doesn’t build up and explode and kill you. Also, note that if you use a submersion blender you really have to blend a lot to get the seeds to smooth out. Taste for salt and set aside to cool. Preheat a large pan over medium heat. Saute the onion in oil with a pinch of salt for about 5 minutes, until translucent. Add the garlic and saute just until fragrant, 15 seconds or so. Add the mushrooms and salt, and cook until they’ve released a lot of their moisture, about 5 minutes. Add the pinto beans and lime juice and cook just until heated through, 2 minutes or so. When the roasted potatoes are ready, toss them into the filling mix. Taste for salt and set aside. Drain the cashews. Add everything to the blender and puree until completely smooth. It’s rather thick, so definitely scrape down the sides with a rubber spatula often or so to make sure you get everything. Refrigerate until ready to use. So we’re just going to be adding layers of sauce, tortillas and filling, then topping it all off. Let’s begin. Lightly grease a 9×13 casserole pan. Ladle in a thin layer of enchilada sauce, then layer 6 tortillas into the pan. Now things are going to get a bit messy! Ladle in another layer of enchilada sauce (about a cup’s worth), and flip each tortilla to smother in the sauce. Each one should be coated, but you should still be able to see the tortilla, that is to say, it shouldn’t be drowning in the sauce. Next, layer the tortillas so that they’re slightly overlapping and covering the bottom of the pan. Now add half of the filling, and pour on 1/2 cup of sauce or so. Layer in 6 more tortillas and repeat the process of smother each of them in a cup of sauce. Cover with the remaining filling. Once again pour 1/2 cup of sauce over the filling, and add the final layer of tortillas. Smother those in a cup of sauce. Reserve the rest of the sauce (if any) for serving. Finally, top with the cashew sauce. I pour it directly out of the blender and try to ribbon it in thick globs over the top. It doesn’t have to be neat, it will look cute pretty much no matter what. Place in the 350 degree oven, and bake uncovered for about 30 minutes. The topping should be lightly golden. Remove from oven and sprinkle with a handful of pepitas and chopped fresh cilantro if you like. Now it’s ready to serve! 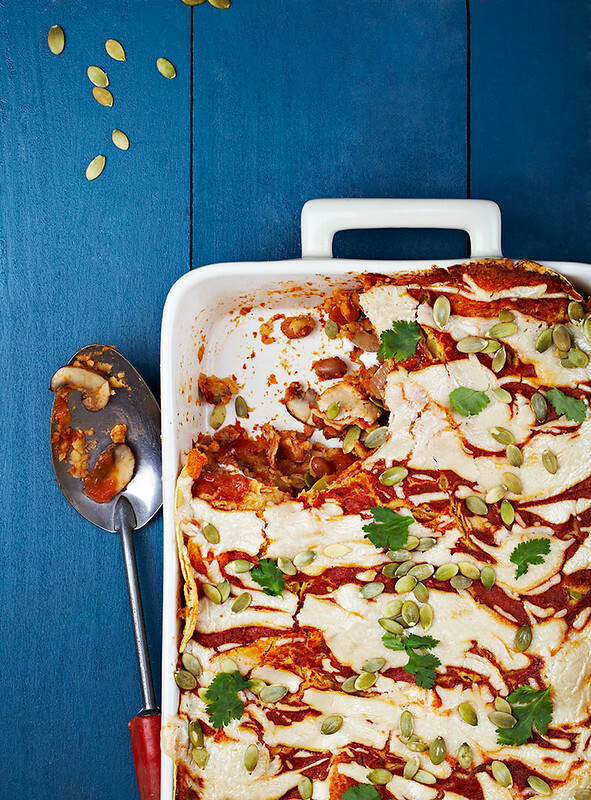 With the layering of the tortillas, it’s kind of an ¡enchilasagna! Love it; going to make it tonight! I've already got a bunch of cans of diced tomatoes — may I use those instead of whole tomatoes? Sure! Pretty much any veggie that you love, honestly. Thinly sliced zucchini or eggplant would be great! This looks gorgeous. And I know it will taste great because you NEVER disappoint! My new cookbook is due to arrive today! So excited. Congrats. I’m a huge fan and I tell everyone about you. Loving your new videos. Are all these recipes in Isa Does It? This recipe became the last kick in the rear end to order your book 🙂 You take the intimidating our of vegan. !!! Another awesome recipe, delivered in the most entertaining and enjoyable medium! ♥ Thanx for sharing. can you suggest a substitute for the cashews or the sauce? I’m allergic to nuts (not brazil nuts, but they won’t taste here) and a lot more. Contained your corn tortillas wheat? You rock 🙂 Thank you for posting this recipe. If you wanna just use your favorite melty vegan cheese, that would be cool. And no, the tortillas are corn. Is it possible to use ground coriander & cumin instead of the seeds? If so, what would the measurements be? I have everything to make this right now except for the seeds! I just pulled this out of the oven. My whole house smells amazing! Thank you for another wonderful recipe. I am getting spoiled quick! Lovin these videos…right in time for fall weekend/football/family dinner nights! Thank you sooo much. The chili was AMAZING, by the way. Can’t wait to try this “cassie”! As a side note: I am all about free (who isn’t), but I would pay to have these show up in my e-mail through-out the week…on weekends…whatever. Not sure what you have planned…but I don’t want these to stop! Made it yesterday, it was delicious! Thanks! Wow, that looks very interesting. It looks like it was delicious once of course, can not wait to try this recipe with my daughter. oooh my I just received your new book on my door step.. what can | say….. absolutely stunning and the recipes look delicious cant wait to start digging in.. thank you so much for another great and I mean GREAT cookbook..
Super yum! I added a cup of corn to the filling. This looks so beautiful and delicious, can’t wait to try﻿ them. Thank you, Isa, for another wonderful recipe. This looks delicious! Just wondering if kidney beans would work for the filling? Great idea on move to video recipes! Happy vegan day! To all the VEGAN FAMILY, I love you guys so much. Could you assemble this early in the day, stick in the fridge, then bake later? Yes, but I would put the cashew cream on right before baking. I made this for my daughter’s birthday party and it was a huge success! It was easy enough to make on a very busy day, and delicious enough to appeal to everyone who came. It is GF, stick-to-your ribs, salty, creamy, toothsome vegan perfection. Thank you for sharing the recipe! I just made this and it was amazingly rich, filling and delicious! I’ve never been disappointed with one of your recipes. I have been making enchiladas like this for a couple of years! I made them the “correct” way once and figured way waste all that time rolling things up when you end up eating them with a fork anyways. Isa makes everything simple! Love the new book! I made this, loved it, took terrible photos and blogged it. Thanks for another superfab recipe, every time the postman drives by without delivering my copy of Isa Does It, I spontaneously combust a little. YUMMY! Made this last night with 2-15 oz cans of trader joe’s fire roasted tomatoes and a 28 oz can of whole tomatoes, that sauce was killer! Definitely going to be a regular at my house. Thanks, Isa! yum! do you think this will hold up if i prepare it ahead of time, put in fridge for a few hours, and bake later in the evening? I just made this tonight, and it is awesome! Your enchilada sauce is to die for. 🙂 Thanks for another great recipe! Mine is in the oven right now. Cannot wait to have some. Was going to be for dinner tomorrow night. Not going to make it. That is a sweet Hodor shirt!! And the enchiladas look good too…I put them on the meal plan for next week. can i use whole wheat tortillas or will they become too mushy? Amazing recipe (can’t wait to cook it tomorrow!) and a very charming cook! 🙂 Love your videos! Hahah you said ‘Jewish girl enchiladas’ and I laughed, and then you said ‘It will explode and you will die’ and I laughed more. You’re my new favorite tv show. 1) Some of my potatoes are not as soft as I’d like. I’m guessing this is because I either cut them a little to large, didn’t bake them quite long enough (or high enough heat) the first time, or didn’t smother them in enough sauce to help them get softer the second time ??? Super bummed but live and learn! Hopefully I will figure it out next time. 2) The amount of cashew sauce was a little too much for me (still had a little left over) so next time I plan to layer a little of that inside the enchilada. 3) I had about 3/4 cup – 1 cup red sauce left over. I followed the (add 1/2 cup, add 1 cup) “rules” but maybe I should have ‘smothered’ more as the video says. Hilarious video. And a yummy looking recipe! I love Jewish-girl Mexican food, it’s a specialty of mine. Made this tonight after you inspired me with your super awesome video! I had never made the cashew cream, and I was a little unsure how it would turn out. AMAZING! Can’t wait to make your meaty beany chili next after these leftovers are gone! The best! Took this to a potluck last night in San Antonio, and it got so much praise. Don’t worry I sent them your way 🙂 Loving the new book! This looks incredible! Thanks for the homemade enchilada sauce recipe!!! I’m so excited to make this! Could I use the cashew flour/ meal and add water as a cheater way to make the cashew cream? Just call me lazy, thanks for your AWESOME recipes. Veganomicon is my bible. Made it…like it….will chop the potatoes a bit smaller next item…and there will be a next time! We made it for A Vegan Christmas and it was hella good! Ahhhh! A lot of work but really worth it 🙂 thanks Isa 🙂 we also made vegan egg nog and the rosemary chocolate chip cookies! Keep up the awesome work! Made this a few weeks ago and ate it for every meal till it was gone. I have no regrets. I didn’t have any shrooms on hand so I used tempeh instead and it was tasty. My omnivorous husband ate it and loved it, especially the “cheese”! I did use whole wheat tortillas, but next time i’ll stick to corn because the wheat got really soggy. This was yummy! Omni hubby approved! Thank you, Isa! Hey I don’t know if its the same situation where other people live, but in Minnesota the price of cashews is exorbitant (organic or conventional) even for just a cup. I left out the white sauce and it was still delicious, but do you guys have any recommendations for a cashew sub? This is a wonderful recipe! I loved the combination of flavors and textures, and I was impressed at how well it held together when serving.I knew my blender wouldn’t handle the whole spices, so I toasted them and ground them in my spice grinder before I put them into the sauce. I also added a chipotle pepper in adobo for a little smokiness and bite. When I assembled it, since I had the sauce in a mixing bowl from using my immersion blender, I just dunked each tortilla in the sauce before laying in the pan, and then put a little sauce over each layer.This recipe will be a great framework for variations; I’m thinking about grilling zucchini slices and subbing for the mushrooms, or making the filling out of black beans, corn, black olives and green chiles. I liked this recipe so much I bought the book. Can’t wait to get it! Thank you! What can I substitute for the cashews if we cannot have peanuts/tree nuts in our recipes, due to allergies? Thank you! Looks delish! Making this for Super Bowl! ZOMG!! This was even better than I’d imagined! I added a jalapeno and a can of Hatch chilis to the enchilada sauce, but aside from than that, I followed everything to the letter. It was a huge hit! My boyfriend hates the word “casserole” so I was careful not to let him see the recipe as I was making it. 🙂 Thanks for all the great recipes, Isa! I keep meaning to ask this question. I am allergic to nuts (all) and peanuts. I have substituted seeds for certain recipes, but haven’t experimented with sauces… Would sunflower seeds be an acceptable substitution for the cashews and pine nut recipes? I made this for some meat eating friends who came over for dinner. They both came back for a second helping. It is absolutely delicious and perfect for a small get together. I would recommend this to anyone trying to feed non-vegan house guests. Just made this for my Valentine sweetie and kids. They were awesome helpers! Couple of mods, I’ll let you know how it goes. Thanks! UPDATE: This delicious meal went very well! My fiance is a huge fan of vegan Mexican food and the authentic taste it delivered made her very happy. My kids dove in for seconds! Thanks again! This was SO GOOD! I halved the recipe and I ended up quartering my tortillas to make them fit in my 8×8″ baking dish. I was worried it would be a mess coming out of the pan, but I let it cool for a few minutes and it was easy and neat to cut into. Super-substantial, too: we were each full after one piece. I think next time I might try mushrooms *and* zucchini, or maybe even some spinach, just to add more green to it, but other than that I would not change a thing. Thank you for another great meal! Everyone must make this. Its so so so good. Just made this with Purple kale and green beans in the filling. Too damn good! What kind of casserole are you? Has anyone used cashew meal instead of whole cashews? I was thinking it would eliminate the soaking step but was not sure about how many cups of whole cashews equal a cup of meal. hi, lovely recipe, but wouldn’t it be entomatadas? cause it doesnt have chili. 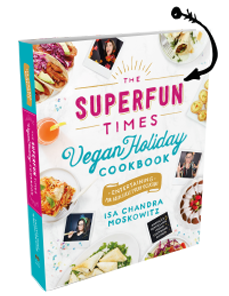 I got “Isa Does It” for Chirstmas and made this for my super-mid-west, non-vegan parents and they loved it so much that my mum asked for the recipe. Its not a quick recipe but damn, its delish! Thank you for being ah-mazing. This looks GLORIOUS!!! hoping to try it friday, but my boyfriend is insisting on green sauce for it. Would you recommend your verde recipe instead of the red sauce? I’m a meat eater, but this recipe is so wonderful my husband and I were nearly convinced to give it all up. Simple steps to make good ingredients taste deliciously complex. I’m so proud to have been able to deliver for vegan visitors. Isa, you are a very persuasive lady. Thank you! this is the best enchilada recipe i’ve ever used- never using the store bought kits again! This was SO good!!! I used baby Bella’s cause I couldn’t find Cremini. The only thing I wasn’t clear on was the 3/4 cup water in the cashew cream…. Was that to soak the cashews or add to the blender? I added it to the blender and my cream was watery 🙁 yet still delicious. Ok now stop reading reviews and go make this awesomeness. I must confess… you are the best & I LOVE YOUR RECIPES. I’ve been using your recipes online for a couple of years now and I finally bought the cookbook, and cannot get enough of it. The book has awesome tips as well as hundreds of fabulous recipes. Plus, it’s super kitchen and cooking friendly, as in it doesn’t just slam shut when you take your hands off it to slice an onion, etc. EVERYONE should buy it. Bringing this lovely casserole to my non-vegan family member’s Thanksgiving, and I am sure it’s going to be gobbled down by all. My son is on a temporary allergen-free diet, and I’m having trouble finding Dinner’s we can all eat together. This one was a big hit! I just replaced the cashews with sunflower seeds to make the sauce and it turned out delicious (though not as pretty). Thank you for the help!! Are the corn tortillas the hard or soft kind? Also, for some reason I ran out of sauce. Smells great so far though! I am sure someone already mentioned this but I followed the assembly directions, then realized after I put it in the oven that the potatoes were never mentioned in the assembly directions. I took it out of the oven and tried to wedge the potatoes in between the layers. I am sure it will taste wonderful, but wanted to let you know that the potatoes were left off of the final project. Adored this, turned out wonderful, exactly as pictured… Thankyou so so so very much. This was the first more elaborate recipe I’ve ever made and I couldn’t be more excited or thankful! I made this yesterday and we just loved it! Warning: it makes enough to feed an army. Hubby and I will be eating on this all weekend. Isa Does It cookbook has become our favorite. Every single thing I make from it is delish. I am working my way through it and trying not to repeat anything but have to admit, we have had the Jerk sloppy joe’s more than once.